There are many things I like about working from home, but having to play games in my office at the weekend because that’s where my gaming PC lives isn’t one of them. Instead, I want to be downstairs playing games in our living room, where I’ve got easy access to the kettle / biscuit tin and can actually spend some time with my husband and fellow RPG vid bud Matthew instead holing myself up in our lonely back bedroom for a large chunk of the day. Of course, playing games in the living room is quite different to playing games at a desk. For starters, the desk doesn’t exist, and unlike the myriad of console boxes sitting under our TV, Windows 10 isn’t really designed to be used with a controller. Instead, you need a mouse and keyboard, whether it’s for simple things like logging into Steam and firing up a game, or actually using them to play said games. Corsair’s K83 Wireless entertainment keyboard is one way of doing it, but a proper lapboard such as the Roccat Sova is definitely the way to go if you want to replicate that full best gaming keyboard experience from the comfort of your couch. There are actually two versions of the Roccat Sova: the cheaper £130 / $133 membrane version that I was sent for review and a proper mechanical job that goes for £140 / $181. Both share the same honking great plastic chassis, though, and both come with the same replaceable mouse mat, wrist rest and underlying cushion functionality (although where you’d get said replacements from given Roccat’s own website doesn’t even sell them is up for debate). The only major difference is the overall feel (and sound) of the keys themselves. Now I know some people wouldn’t ever stomach the idea of going back to a membrane keyboard if they’re already mechanical converts, but it’s worth pointing out that the quieter keys of the membrane Sova are definitely more living room-friendly than the CLACK CLACK CLACK you’ll get on the mechanical version. The membrane Sova is by no means completely silent, of course, but I reckon it’s much less likely to result in stuff getting chucked at your head when using it in close proximity of other human beings. It’s also perfectly responsive for playing fast-paced PC games, too. 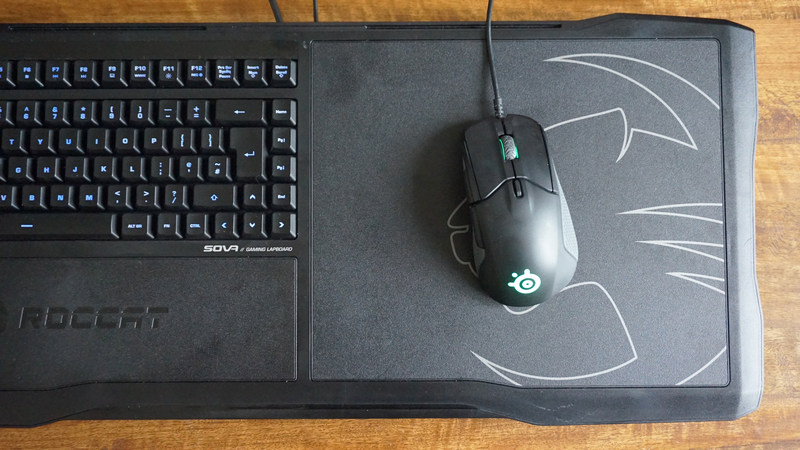 I’ve played a big chunk of The Division 2 on the Roccat Sova, for example, and I’ve never put a foot wrong once. All the keys are wonderfully spaced and give a good amount of tactile feedback, and the decent-sized mouse mat area provides more than enough room for zipping the camera back and forth as you scout out those last hidden Hyenas and pesky True Sons hangers-on when you’re right in the thick of it. Now there’s no beating around the bush here – the Sova is absolutely massive. Measuring 280x646x37mm and weighing 2.35kg, it’s a lot heftier than, say, the sleek Razer Turret, which has a fold-away mouse mat for easier storage, and it’s a bit of a faff to make room for it on our coffee table once I’m done playing. It is, however, immensely comfy to use for long periods of time. Despite the whole thing being quite cumbersome for someone of my stature, I was able to sit with it on my lap for hours regardless of whether I had both feet planted on the floor or was cosied up in my preferred position of sitting cross-legged. The hard wrist rest did occasionally start rubbing after a while, but that was usually only after several hours of non-stop play and certainly long enough to get a good afternoon’s game time in. The Turret, on the other hand, wasn’t nearly as stable when I tried it out for myself during my CES demo, and the mouse mat area also felt a lot smaller than what you get on the Sova. What’s more, while the Turret has the added bonus of coming with a bundled Razer Mamba Wireless mouse, the magnets it employs to hold it in place when it’s not in use often got in the way when it actually came to playing games with it, and it often felt like I was struggling to move it where I wanted. 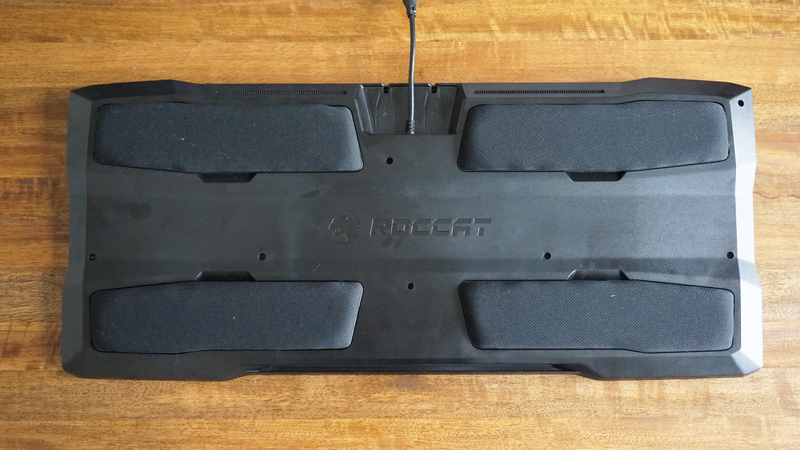 There are no such restrictions with the Sova, and for once Roccat’s tendency towards the big and bulky side of peripherals actually works out in their favour. More importantly, there isn’t an RGB in sight on either model. Just a plain blue backlight that keeps things nice and simple and doesn’t distract from the action at hand. You can also adjust the brightness straight from the keyboard itself using the Fn buttons (which is where you’ll also find the Sova’s onboard media controls), or use Roccat’s Swarm software to configure it on a per-key basis if you want to highlight specific functions or controls. 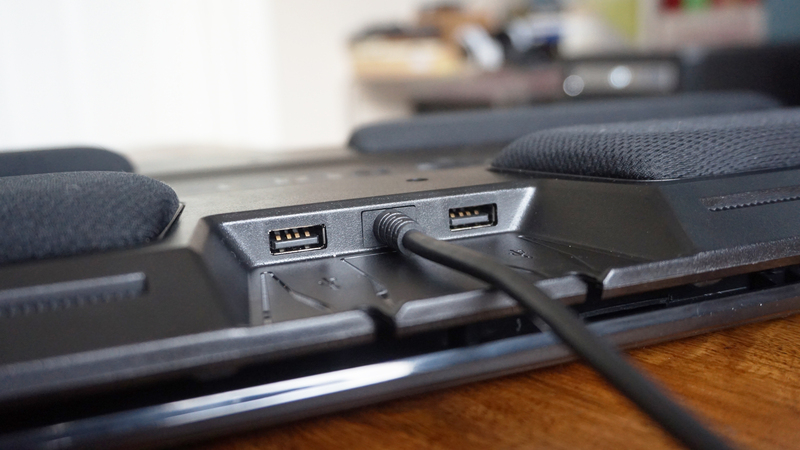 I also love the fact there are two USB ports tucked away on the back of the Sova next to its 4m break-away cable. One will obviously be occupied by your mouse most of the time (whose cable can also be tucked into the docking rail along the upper edge of the Sova or used in conjunction with a clip-on bungee), but the fact that I can also use the other one to connect a controller or USB headset without having another giant cable dangling across the floor and providing another trip hazard for my cats is just an absolute god-send – and a big part of why I like it so much. It’s essentially a one-stop shop for everything I need for controlling and interacting with my PC, and for me, it’s exactly the same as playing games on my desktop upstairs, which is all I could ever ask for, really. There is the small matter of the Sova still being quite expensive, with the membrane version going for the aforementioned £130 / $133 and the mechanical one an even more princely £140 / $181, but in my eyes the membrane one at least is absolutely worth it. Sure, it’s not quite as effortless and easy to extricate yourself from as the Corsair K83 Wireless, but it still does everything I want it to, and it does it without compromise. I never feel like I’m simply having to ‘make do’ or ‘put up with’ anything while playing games on the Roccat Sova, and everything just works straight out of the box – which is more than can be said for Corsair’s K83 Wireless. 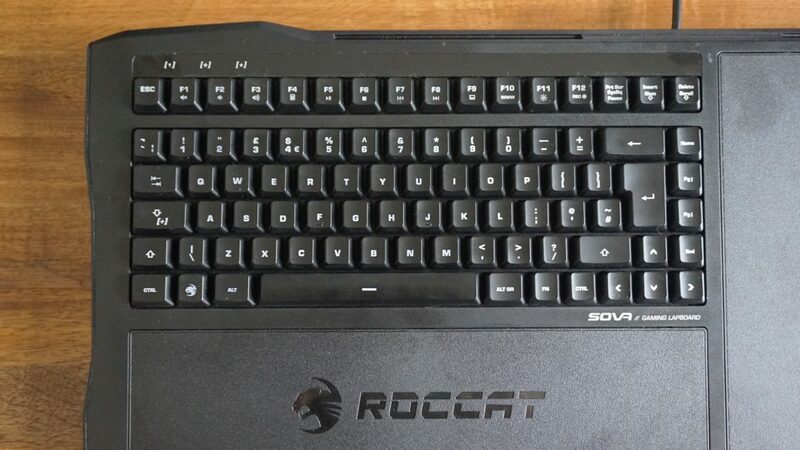 As a result, the Roccat Sova goes straight in as my new best lapboard recommendation on my best gaming keyboard list. Tagged with feature, Hardware, Keyboards, mouse and keyboard, Roccat.